The competition was intense, and those recognized as Stevie Award winners should be immensely proud of this accomplishment. 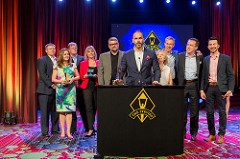 HCL America, part of HCL Technologies, a $7.4 billion global company that helps global enterprises reimagine their businesses for the digital age, sponsored the HCL 21st Century Enterprise of the Year awards, in 13 bespoke categories. Stevie winners in these categories include Allscripts (Chicago, IL), BD (Franklin Lakes, NJ), Citi (New York, NY), Cummins Inc. (Columbus, IN), Deloitte (New York, NY), Merck & Co. (Kenilworth, NJ), Oncor (Dallas, TX), Symantec (Mountain View, CA), The Vanguard Group (Valley Forge, PA) and Verizon (New York, NY), among others.